Custom-fit golf shop in Novi thrives as larger competitors struggle. Golf Tech Inc., a retail store in Novi that custom fits golf clubs, draws customers locally and from as far away as Grand Rapids, Kalamazoo, Jackson, Bay City, Saginaw, and the Thumb area. As notable golf equipment stores in metro Detroit have shuttered their doors and gone out of business — Nevada Bob’s, Caddy Shack, Golfsmith, and King Par, to name a few — a cozy, 1,500-square-foot store in Novi chugs along profitably, just like The Little Engine that Could. Golf Tech Inc., a labor of love passed on from a father to his son, is thriving despite the downturn in the golf industry. The failures of its much larger competitors opened new opportunities for Jim Kitchen and the Golf Tech operation that he took over from his father, Dennis. Where the defunct stores were loaded down with costly overhead in apparel and golf accessories, Kitchen focuses on basic needs like custom-fitting new clubs, selling used ones, repairing damaged clubs, refinishing and personalizing clubs, re-gripping and re-shafting, adjusting lie and lofts, and offering lessons. In addition, Golf Tech can refinish a driver in a customer’s favorite team colors, restore old collector’s clubs, or emboss initials on a trusted putter. Buying and selling used clubs is a big part of the business, as well. Golf Tech is certified as a performance fitting center, meaning the store can sell finely-tuned shafts for the most discerning golfer. Christian Ludwig, a Westland resident and an automotive software engineer, is a 10-year Golf Tech customer who demands the precision of fine-tuned shafts on his everyday clubs, while appreciating the art of playing the game with old hickory sticks. “They’re the only ones that I’ve found that can do both, and they never disappoint,” Ludwig says. The story of Golf Tech’s success began with the Detroit Police Department’s narcotics section, where Kitchen’s father, Dennis, spent a major portion of his career as a police officer. 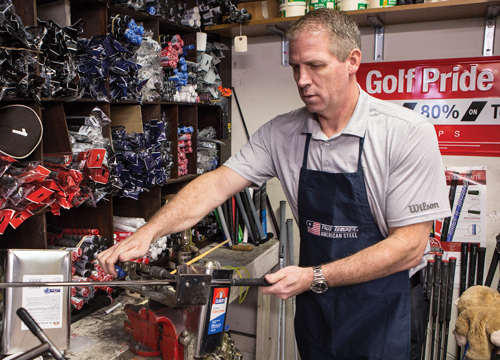 The sergeant’s passion for the game led him to tinkering with clubs as a way to relax. “I love golf and I was always curious about clubs, how they were put together, and how they worked,” Dennis says. That early interest in clubs led him to the time-consuming hobby of refinishing the heads on classic old persimmon wood clubs. When he retired, Kitchen opened his first golf shop in 1988 in Livonia, and two years later he moved into the space at 41300 W. 10 Mile Road. With an eye on playing more golf, Dennis turned the daily operation over to Jim in 1992. Now the senior Kitchen helps out in the store and is Golf Tech’s instructor. 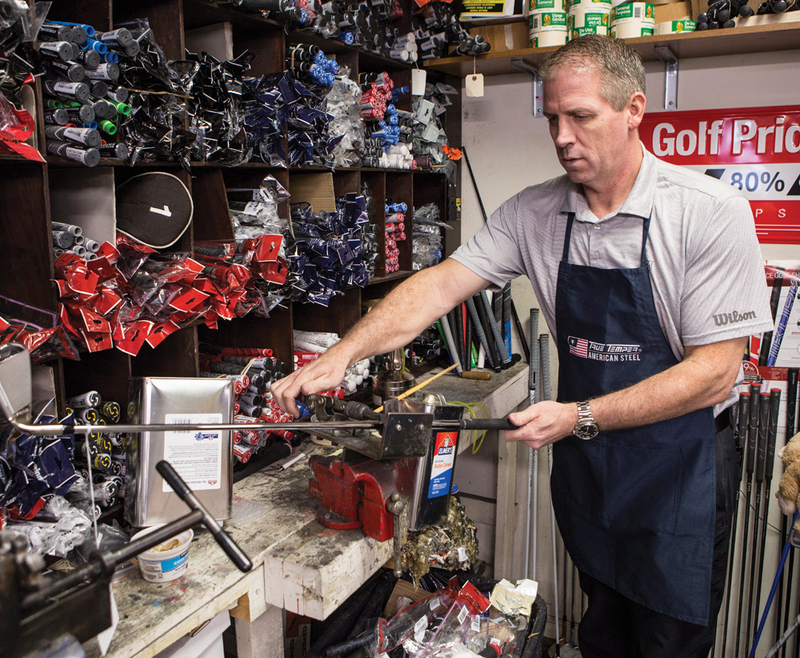 One of the keys to Golf Tech’s success is a trio of Mitchell angle machines that Jim and a pair of part-time helpers use to bend or adjust clubs to the proper lie and loft for individual players. “Golfsmith had these machines but used them only for customers buying clubs. We offer the service to everybody,” Jim says.